GRIZZLY BEARS are currently listed as THREATENED in the province of Alberta. As such, numerous initiatives are being undertaken in the Bow Valley to reduce interactions between people and bears and the resulting removal of bears. The Institute supports research projects that focus on enhancing our knowledge of techniques and initiatives that reduce such interactions. 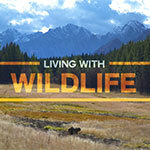 This is done with the support of government wildlife managing agencies and local communities. This area of work provides wildlife managers an opportunity to consider alternative methods to manage “problem bears” through science-based research.